Boating may be one of the best ways to slow down the rat race we call life. Whether it is by sail or power, once on the water a person can slow down and enjoy their natural surroundings. With a few deep breaths the present moment is easily taken in. Just about any body of water will work, however salt may be the best. It has been said that coastal air is different than air found inland. Coastal air is charged with negative ions causing the body to absorb oxygen more easily. Serotonin levels are equalized which decreases stress and improves mood. This helps people to sleep deeper and more peacefully, causing a positive effect on ones health and overall well-being. Feel the motion of the ocean in your blood after a couple of hours at sea. You can even do this by simply floating on your own, since salt water increases natural buoyancy. Sea legs are a real thing. Many people have experienced a sense of rocking back and forth once on land. There is an actual fancy name for this, ‘mal de debarquement’ or ‘illness of disembarkation’. What causes it? There are a couple of theories. One is that while on a boat, your brain has to “explain” to your body to not over compensate for rocking motion by drastically throwing ones self around when the boat pitches. The other is that fluid in your inner ear, which controls balance and lets your brain know if you are upright, sideways, vertical or upside down, continues to move once you arrive on land. While most people are fine with this feeling some do not like this odd sensation. Either way it will cause you to move slower while your senses return to normal. 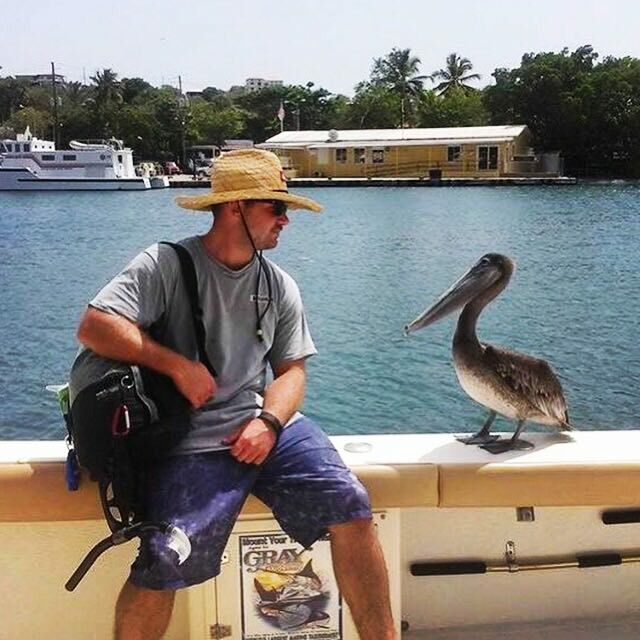 If you really want to slow down, meet others and experience a very cool side of island life, try hitchhiking. While this is not a good idea everywhere you go in the world, there are a few islands where this is a safe and common practice. The reason that hitchhiking is a normal occurrence on these little rocks is due to the lack of cars and often a lack of parking. If you do decide to hitch a ride, first ask a local if it is ok where you are, and if they have any tips for you, perhaps the best place to pick up a ride, or the commonly used hand signal for the location you are in. This is often not a thumb pointing out as Americans are used to seeing. Pointing your thumb is actually a very offensive gesture in some places around the world, like flipping someone off. Once on your hitchhiking way, it is time to slow down and learn patience while you wait for a kind commuter. This is a time you can learn all kinds of thing about yourself including how you deal with rejection. You may pass the time by familiarizing yourself with your natural surroundings, listening to music or making up your own stories of what wonderful person will be picking you up. These are some of the best encounters with kind, friendly and grateful people. Sit back, enjoy the beach, snap a picture or two and post them later. Your friends will be jealous no matter when you post your tropical beach pics. This is one of the best times to learn to unplug and disconnect. There will be some anxious moments wondering where your phone is, if it is ringing and why it is not in your hand. These thoughts will pass. You will be grateful for the moments of beauty you lived and didn’t see on Facebook. That missed call can leave a message. Nomophobia, coined in 2010, is the fear of being without mobile phone contact. There is nothing better to slow you down than to watch nature unfold around you. Two things you need for bird watching is an identification guide and some binoculars. You can even skip the guide, but it makes the experience a little more interesting and educational. Without the binoculars everything just looks like an LBB (Little Brown Bird). A couple more things needed for a good bird watching experience are an established habitat, a comfy chair and some patience. You will be amazed by how much goes on when one simply takes the time to look at our surrounding environment. This is a relaxing and calming experience, similar to meditation. While watching the world carry on its daily routine, we can learn a lot about the inner and outer workings of nature and ourselves. I love the water and have discovered that no matter how one chooses to enjoy it, being in the water is good for the soul. A few of my favorite ways to center myself and slow down my thoughts include floating, both on my back and with a snorkel; methodically swimming until my endorphins kick in; and just standing shoulder deep in the waves while looking at a beautiful view. I focus on my breath and the pressure of the water supporting me. While doing any of these activities I let go of each thought as it comes up. I don’t dwell on anything that is not in my present view. Focusing on the color and softness of the water, how cleansing and freeing it feels, allowing the subtle tides to gently push and pull oneself is truly a serene experience. Throw on a snorkel and find yourself a turtle to hang out with for awhile. If you have never seen a sea turtle, and you are in an area where they live, you should ask a local about where you’re best chances are to find one. Once you snorkel around some boring sea grass beds you may be lucky enough to encounter a chomping, munching Green Sea Turtle. These are enchanting creatures and can really take your mind off just about anything. Take your time and enjoy floating with them. These large turtles are very beautiful, very old and can seem almost wise if you allow your mind to get carried away with such thoughts. Do your best to keep yourself from trying to swim away to find the next one. Simply enjoy the experience you are having, clearing all other thoughts and focusing only on that one turtle. Say hello to the people passing by. Say “Good Morning”, “Good Afternoon” or “Good Evening” to people as you come into a room or to those walking by you on the street. This is a very uncomfortable practice for us fast-paced Americans and at first it may feel very unnatural to put oneself out there like this. It is customary in some places around the world and considered rude if you do not do so. It is rare that the kind reception is not returned and it makes everyone feel good. This is a very common practice in smaller towns and slower paced societies. It is another tool to help bring your mind back to the present moment and the people around you. You may even strike up a conversation that you never thought you would have. Slather on that REEF SAFE SPF and get yourself some Vitamin D from that burning ball of gas in our sky. Whether you are lying on the beach or hanging in a hammock, this is the ultimate in island time living. Do as little as possible. Stroll in the sunshine while stopping to enjoy the shade of the coconut trees. There are multiple health benefits to spending some time in the sun. These include enhanced mood and energy through the release of endorphins. People tend to move much slower in warmer environments for the obvious reasons. So, you want to get yourself on island time? You need an unbiased opinion of what boat best fits your needs or what beaches you must see. 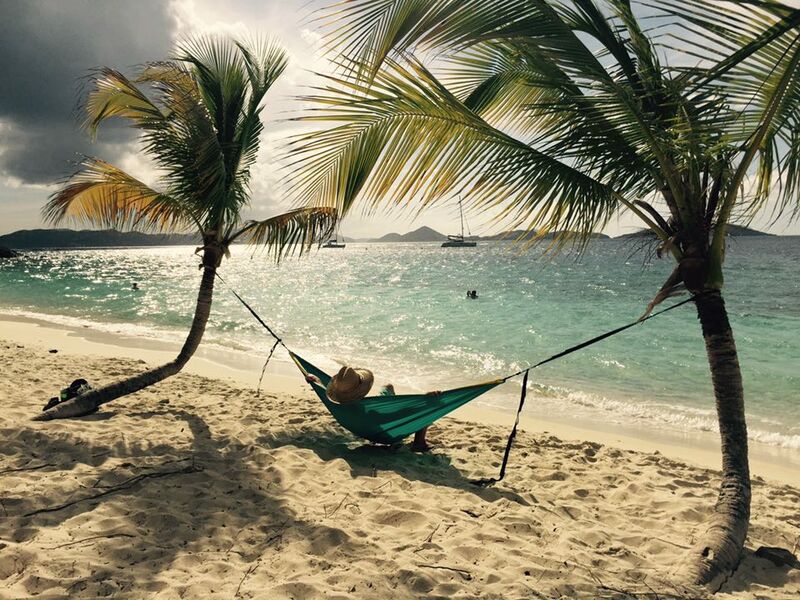 If St. John or St. Thomas USVI is on your list of destination vacations, let’s chat. I am a free service concierge. I only have the customers’ wants and needs as my directive of which activities to offer. I work with over 100 companies. The prices quoted are the same you’ll receive if you go directly to the individual business. I do not offer any boats that I have a vested interest in. I am here to help when you are ready to begin making your travel plans. I love the islands and enjoy watching people slow down as they progress into their vacation. Listening to peoples experiences, both good and bad, helps me guide the next customer to what is most suitable for them. If I don’t have your answer, I will find it. Sit back, relax and enjoy some island time.